The award can be requested by all the OM'S and SWL who are member of A.R.I. or a Radio Society which is member of I.A.R.U., and can demonstrate to have had QSOs with stations affiliated with ARI. We consider valid all QSOs after January the 1st 1997. There is only Fixed category in each way (SSB, CW, Mix, or Sat) There are not valid QSO via repeater or transponder earth based. A.R.I. 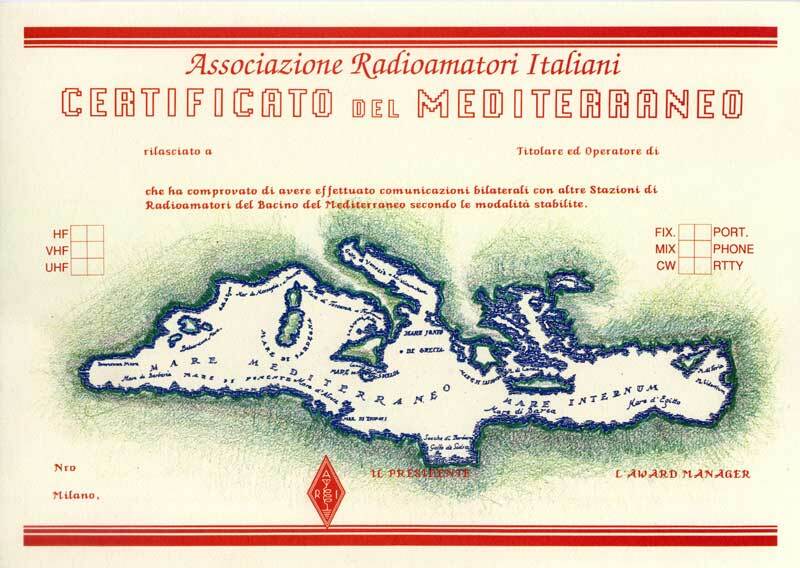 (The Italian Amateur Radio Association) sponsor, starting from January the 1st 1993, the "C.D.M." award. All the 110 Italian provinces are valid for the award. The C.D.M. award is given to the operators of Amateur Radio Station who can prove to be associated to I.A.R.U and that have made 2 ways contacts/HRD on CW, SSB or Mixed (SSB and CW) with other stations in countries/Italian provinces that are in the award list. For the "mixed" category a combination of 20 Italian provinces and 10 DXCC countries of the lists below. Only connections/listenings made starting from January the 1.st 1980 are considered valid. 3. Via Satellite (any input-output mode). QSO made through terrestrial repeaters or transponders, except linear transponders on board of, are not considered valid. A.R.I. 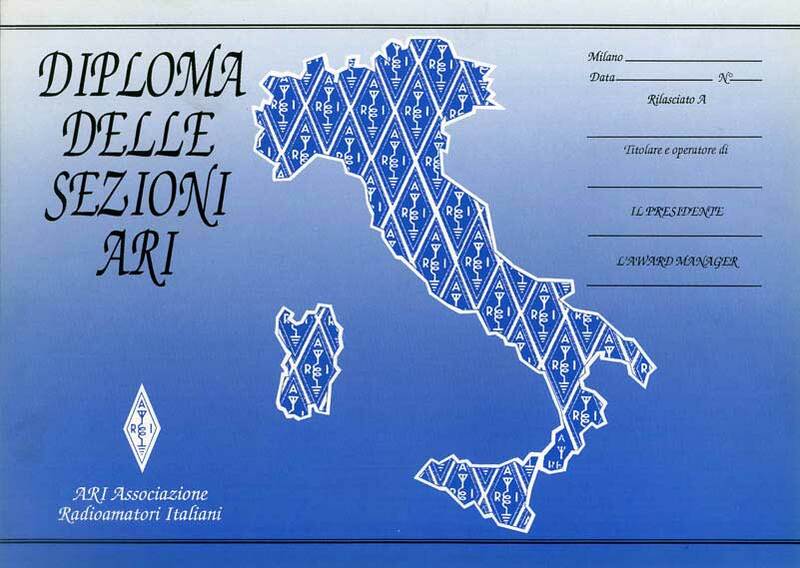 (The Italian Amateur Radio Association) sponsor, starting from April the 1st 1990, the "W.A.I.P. VHF" award (H.A.I.P. for SWL) for 50 MHz band. The award can be requested by all the OM'S and SWL who are member of A.R.I. 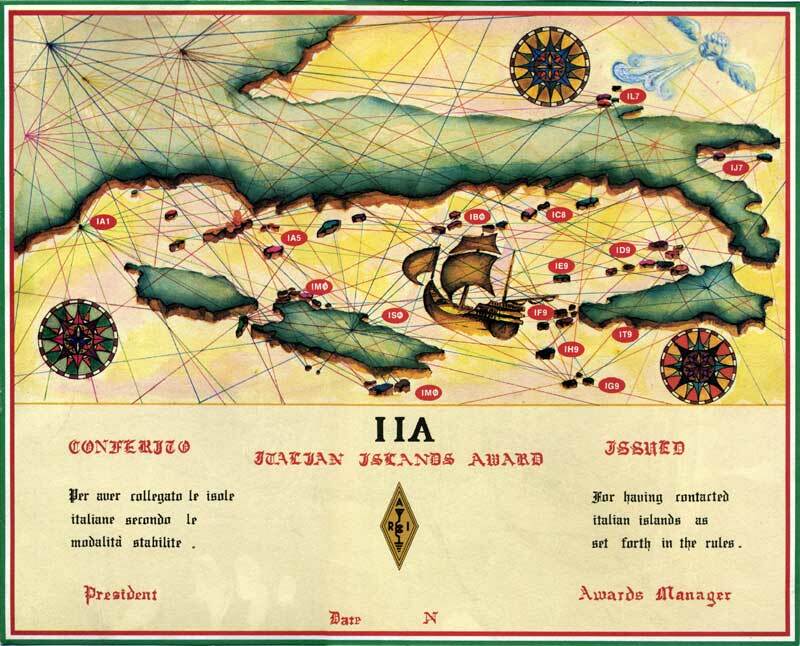 or a Radio Society which is member of I.A.R.U., and can demonstrate to have had QSOs with at least 40 different Italian provinces. All the Italian provinces are valid for the award. The award is available in SSB, CW or mixed (SSB & CW). For the "mixed" category a combination of 10 provinces worked on CW and 30 worked on SSB, or vice versa is accepted. The award will be available for PSK31 and all digital modes contacts starting on January the 1st 2001. 1) a signed and dated letter with which the sender shows that all the national rules about operating a station have been accomplished. 2) Another separate list with all the claimed QSOs. It must contain date, time, mode of emission, frequency, call-sign of each of the worked station. 4) There is no need to send QSL cards, it's enough that the list of QSOs is certified by the national VHF manager or two others licensed amateur radio. The award manager may, in any case, ask for the original QSLs. 5) The award fee is 10,00 €, it includes package and postage. For more info don't hesitate to e-mail or send a message to the addresses below. A.R.I. 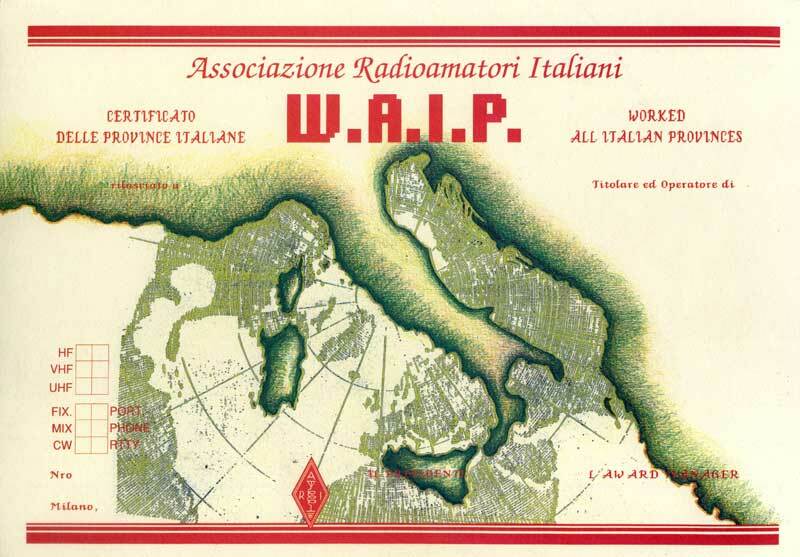 (The Italian Amateur Radio Association) sponsor, starting from January the 1st 1959, the "W.A.I.P. VHF" award (H.A.I.P. for SWL), and from January the 1st 1975 the "W.A.I.P. UHF and SHF" awards, with also RTTY QSO starting from 01.01.1986, furthermore also PSK31 and all digital modes starting from January the 1st 2001. The award can be requested by all the OM'S and SWL who are member of A.R.I. or a Radio Society which is member of I.A.R.U., and can demonstrate to have had QSOs with at least the requested provinces number.